What *can* we do to #BringBackOurGirls, really? 1) a call for or an acceptance of US military intervention. Beware of calling for US military intervention! That has not led to anyone’s peace and sovereignty. Beware of what you are being fed and what is propagated through the media. Let’s not have Kony part 2. How much do you really know about Nigeria and what is happening there? 2) It also cannot turn into people wearing head wraps at rallies that aren’t actually making political demands or willing to do anything beyond wearing head wraps together. Because no number of educated women are a match for men with AK-47s, we also need to support programs that involve men in promoting gender equality, including women’s education and reproductive rights, like the many members of the MenEngage Alliance, and to talk about gender equality in a way that includes men as well as women. 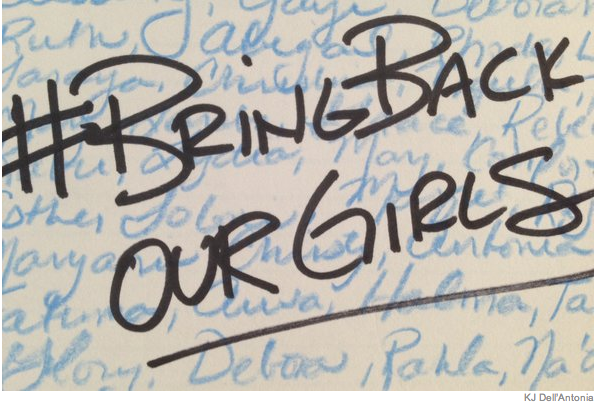 If the missing Nigerian schoolgirls come home, their problems won’t be over. Even assuming (with ridiculous and probably unwarranted optimism) that they have been untouched during their captivity, their communities and even their male family members may regard them as damaged goods. It’s that attitude, writ large, that led to their kidnapping; on the smaller scale, it may mean they can never regain what they have lost. “Real action” to bring about change for the schoolgirls of Nigeria, and for the schoolgirls and boys yet to come, can come from our laptops, our raised voices and our wallets if we let the passion that this story ignited burn on. #BringBackOurGirls will end, but it won’t be the end of the story. #GenderEquality isn’t a very exciting hashtag. But it’s the only message that could, eventually, mean #NeverAgain.